Take command of the ground war with Star Wars: Legion, the two player board game of land-based battles. Whether elite Rebel strike teams or a legion of stormtroopers – from Luke Skywalker to Darth Vader himself, command the battlefield and prove your skills at fire and maneuver. Best Time to Play: Sunday afternoons, in the basement with all your terrain laid out on the big table. 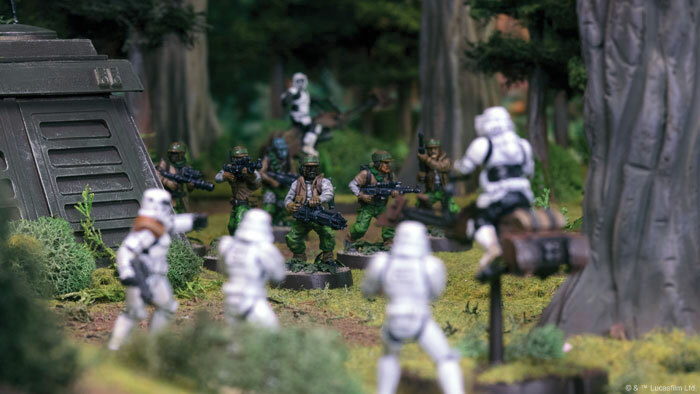 Star Wars: Legion is the latest in Fantasy Flight Game’s line of ‘let everyone relive the original trilogy’ games and every effort has been made to tune this miniatures-based game of tactical combat to be easy to pick up and play. With simplified rules to make the arrays of stormtroopers easy to move and line of sight rules that aren’t a total headache, the learn-to-play book even includes basic instructions for painting the game and how to DIY your own terrain with materials you can grab at any hardware store. The game itself is dozens of unique miniatures, ordered into squads of your choosing and allowing for your choices rather than dice rolls to reign supreme – beyond of course, the chaos of combat. The rules make operating large groups of infantry feel easy when many games turn it into a chore… I can’t overstate how wonderful these systems and others felt in play. It’s effortless. A resistance you didn’t even realize was slowing you down suddenly disappears, like that moment you get out of the pool. Everything about it is smooth. A Legion core set can be had for 70 bucks – and if you get sucked into the world of lightsabers and walker-mounted blasters, there’s a giant pool of new units to acquire. – although most recommend simply acquiring a second core as one’s first big purchase. Decrypt the secret messages left to you by your teammates, but don’t make the patterns too obvious – or the enemy secret agents will be able to intercept your code! Best Time to Play: When a big group is over and ready to laugh their heads off. …while keeping in mind that the enemy is hanging off every word you say. If the enemy team can guess your four words, you lose – if your team makes too many mistakes, you lose. I have never, in my life, seen so much frantic, last-minute lying. A game of discord and deception that somehow ends up fraught, funny and absolutely fantastic. 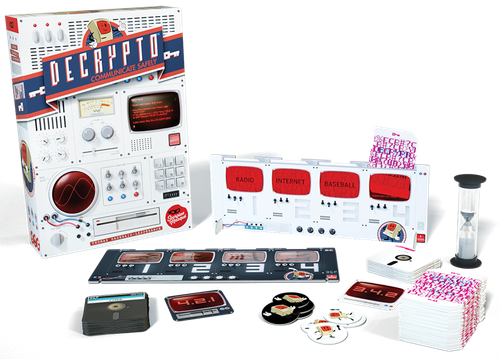 Push forward and deduce the enemy agent’s codewords before they decrypt yours – this is Decrypto. Epic space empire action, with exploration, resource gathering, combat, tech trees, all that good stuff – Ninety minute game time. Best time to play: Late into the night, with your favorite science fiction soundtrack underscoring the tension. The Kurross Empire emerged from the deep, endless pool of space, dark and undetectable. They crushed Earth’s paltry fleet within a week, and broke through the great planetary shield that protected the surface. Bright blue oceans turned to an irradiated wasteland as they bombarded the planet, shredding the remnants of thousands of years of human history. Now the last of the humans – as well as its longtime enemies – are determined to stake their claim on the fringes of the galaxy. Empires of the Void II is a board game of war, diplomacy, and construction. Using an action-selection mechanism that lets players choose whether to take the initiative or ride on your enemy’s coat-tails, ally with the species of the fringe, or invade and rule with a cruel hand – but be ready to meet the Kuross once more. A solid 9. This is an excellent game. If you enjoy space epic style games but you don’t wanna play ’em for 6 hours long, this is definitely one you should look at. Buy Empires of the Void II for a gorgeous game of space-faring exploration from the creator of such beloved games as Islebound and Near and Far. Best Time to Play: With exactly one other person, as a quick, light hidden movement experience. Hunt for the Ring is a hidden movement board game played on two entire different boards as Frodo and his companions attempt to evade detection while moving to Bree and Rivendell, and resist the power of the Ring’s corruption. Gorgeous components, art, and theming make this a must play for Lord of the Rings fans who haven’t got an entire weekend to sacrifice to War of the Ring (by the same designers) – but reviewers note that the game is best as a lighter experience between two players than an epic contest of wits for the full player count. An amazing Lord of the Ring game for 30 dollars, buy Hunt for the Ring for a hidden movement experience of charm and theme alike. Featuring gigantic pre-painted miniatures produced by Weta Workshop, the special effects team best known for Lord of the Rings, Avatar, and Mad Max: Fury Road, GKR Heavy Hitters is an advertising-driven, televised combat sport where mega corporations fight for lucrative salvage rights and advertising dominance in Earth’s abandoned cities. Piloting a Heavy Hitter and controlling your combat, repair, and recon support units, play cards and control your GKRs as you tag buildings for corporate sponsorship (or destroy them) or simply out-fight your opponent’s Heavy Hitters. Any mech-jockey can shoot, but can you STRAT? Guess we’re gonna find out! Very accessible game and great for bringing players in to a possible competitive skirmish game environment. Buy GKR: Heavy Hitters for its incredible production values, high replayability, and MECH FIGHTS.